PHILADELPHIA — The Center for Emerging Visual Artists (CFEVA) and The Schuylkill Center for Environmental Education (SCEE) announced today the launch of an innovative artist residency program designed to address local environmental issues. LandLab, a joint project of SCEE and CFEVA is funded in part by a grant from the John S. and James L. Knight Foundation. The program will bring the artists’ creativity and curiosity to bear on solving environmental problems and promoting environmental stewardship. Artists will collaborate with environmental scientists to create real solutions to local environmental problems, such as rainwater runoff or habitat loss. Each art project will also engage the public in meaningful way, either actively involving them in the scientific and creative process or with a strong educational component in the final project. 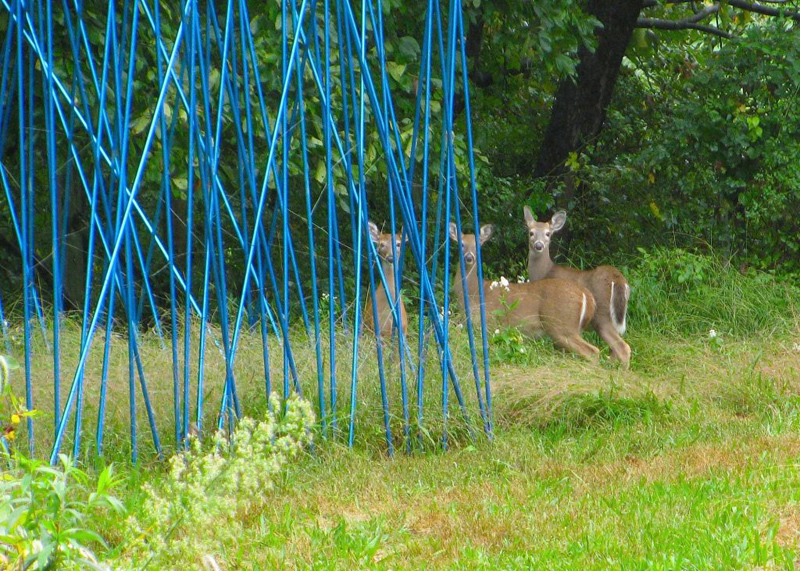 Four artists will be granted six-month paid residencies to explore the Schuylkill Center’s property, conduct research, and develop and create installations which intervene with the land and demonstrate ecological solutions. Residencies will run from April through October of 2014. The final artworks will be on view to the public at the Schuylkill Center free of charge, and all four projects will be presented at the 2015 Science Festival. CFEVA will help manage the recruitment and selection of artists and provide expanded exhibition opportunities. LandLab is one of 48 winners of the prestigious Knight Arts Challenge Philadelphia. The Schuylkill Center for Environmental Education (SCEE) was founded in 1965 as the nation’s first urban environmental education organization. Its 365-acre sanctuary serves as a living laboratory to foster appreciation, deepen understanding, and encourage stewardship of the environment. SCEE reaches over 15,000 Philadelphia-area residents each year with an array of educational programs, including standards-based programs for schoolchildren, continuing education for teachers, and a full calendar of events for the public. The environmental art department sparks awareness of the natural environment with exhibitions of the highest quality that attract, educate and inspire the public. The Center for Emerging Visual Artists™, formerly Creative Artists Network, was founded in 1983 by Felicity R. “Bebe” Benoliel to encourage the career development of emerging visual artists. Since then, the organization has worked steadily harder to provide the support essential to talented individuals building careers in the visual arts. The Center dedicates itself to making art careers viable for those who choose them, helping emerging artists reach their audiences, and promoting interest and understanding of emerging visual art among citizens of the community. Center for Emerging Visual Artists, Ann Peltz, Director, Studio Tours & Exhibitions, 215.546.7775 ext. 13, Ann@cfeva.org. This entry was posted in Art, Art in Philadelphia, Center for Emerging Visual Artists, Fine Art Philadelphia, Installation, Knight Foundation, Philadelphia Art, Philadelphia Art Installations, Philadelphia Artists, Public Art, Uncategorized and tagged Art, Art Installation, Center for Emerging Visual Artists, DoNArTNeWs, Environmental Art, LandLab, mixed media art, Philadelphia, Philadelphia Art, Philadelphia Art News, Philadelphia Art Shows, Philadelphia Artists, Philadelphia Fine Art, Schuykill Center for Environmental Education on August 8, 2013 by admin1.